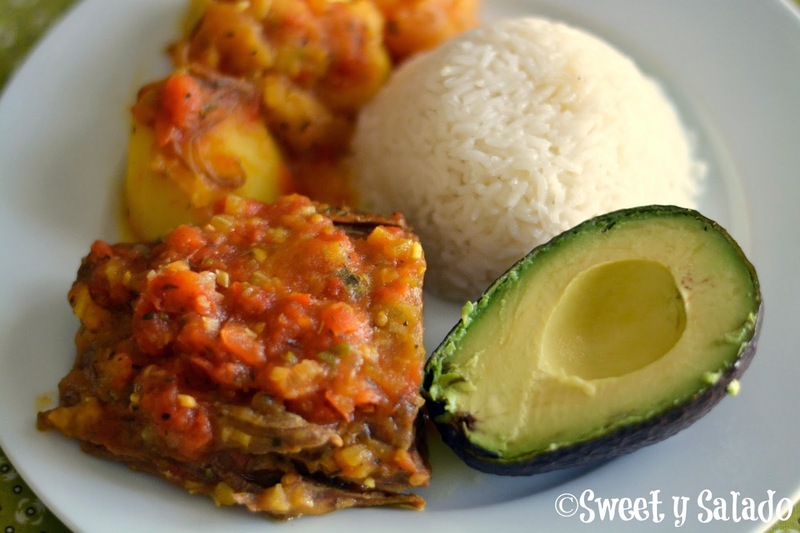 Sobrebarriga en salsa criolla or Colombian flank Steak in creole sauce is one of those special recipes that is often made in Colombia and that is very popular in Colombian restaurants abroad. The flavor of the flank steak combined with the ingredients in the sauce is simply spectacular, and if you’re like me, and love to soak your rice with whatever sauce is served on your plate, then, you’re going to go nuts with this recipe. In order to make this recipe perfectly, I highly recommend you cook the flank steak in a pressure cooker, since we all know how tough that cut of meat can be, that way, the vapor that stays inside the pot will make it nice and tender. There’s nothing worse than eating a tough, chewy flank steak, even if the sauce is out of this world fantastic. And if you don’t have a pressure cooker, then just be a little bit more patient and leave it simmering in your pot for a while longer. You’ll see it’s totally worth it. 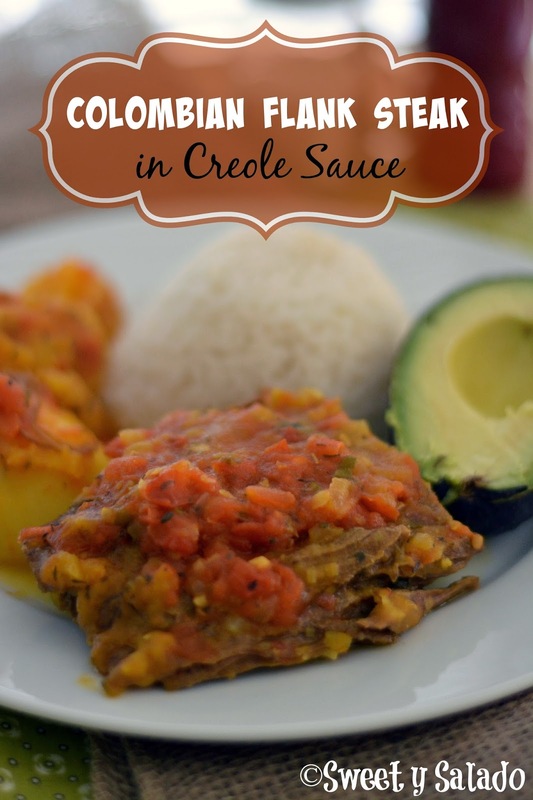 The papa criolla or creole potato that goes in the sauce, even though it’s optional, is key not only because it adds great flavor but also because it helps give it a great thick texture. Besides having a very particular taste, this kind of yellow potato is very soft and delicate, so it will disintegrate a little while you cook it, and that’s what gives the sauce the perfect texture to serve along with the flank steak. Some people like to cook the potatoes separately, but the trick for making this into a fantastic dish is by cooking them right in the sauce. In a pressure cooker, add the white onion, green onion, garlic, cilantro, flank steak (Whole or divided into portions), water, beef bouillon and salt and pepper to taste. Cover and bring to a boil or pressure on high heat. Then, reduce the heat to medium low and cook for 1½ hour if using a pressure cooker, or 3 hours if using a regular pot. Once the meat is ready, release the pressure and uncover carefully. Take out the flank steak, cut it into portions, if you had not already done so and set aside. Drain the beef stock through a sieve and reserve about 2 cups (480 ml). Heat the olive oil in a large pan on medium heat, add the chopped white onion and cook for 2-3 minutes. Add the green onion and the garlic and cook for another 2-3 minutes. Now add the tomatoes and cook for 3-5 minutes or until the tomatoes are softened. Pour in the beef stock you reserved earlier and season with thyme, oregano, cumin, food color and salt and pepper to taste. Remember that the beef stock was previously seasoned, so taste it before adding more salt. Add the flank steak to the sauce along with the red potatoes and papa criolla. Cover and let it cook on medium low for 20 minutes or until the potatoes are tender. Serve immediately with white rice and avocado. Me salio riquisima , gracias por la receta aqui te va una foto.